The AHC40116 Certificate IV in Agriculture is a one year advanced course which follows on from either of the Certificate III in Agriculture programs. Students gain further competencies at level four to equip them for employment as senior stationhands, farm supervisors or in agribusiness. It also prepares them for future roles as business and farm managers. Graduates often gain positions as senior farmhands and stationhands on properties around NSW and throughout Australia. Some are employed in agribusiness such as rural merchandise stores and stock and station agencies. Others may find work with Local Lands Services or consultancy firms. Completion of this course can also give you credit towards some university degrees, particularly if the Diploma in Agriculture is completed concurrently on line. Certificate III in Agriculture or equivalent (Note: Students who have done Year 12 Agriculture and/or Primary Industries AND have sound practical skills and reasonable industry experience and knowledge may qualify for direct entry into this course. Reasonable experience is normally equivalent to working one year full time on a farm. 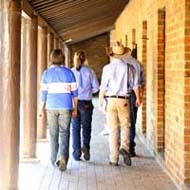 Case studies: students choose from a large range of elective units including livestock health, nutrition, feeding and breeding; feed lotting; pasture and crop production, including soil and pest management; farm finance; total catchment management; shearing and wool classing and machinery maintenance. Practical work: two four-week periods gaining practical experience on commercial farms throughout Australia as well a New Zealand. Fees are charged for board and lodging (includes room and all meals), tours, student association fees, equipment and resources used in the course. They also include Smart and Skilled Student Fee. Fees are payable at the start of each term or by fortnightly instalments.